Crude oil prices remained bullish through out the week primarily due to ongoing geopolitical tension in Middle Eastern region and escalated tension between KSA and Iran. Market is also expecting extension of OPEC and non-OPEC production cut on 30th November meeting. As per EIA data, US production rose to highest ever of 9.62 million barrels a day, re-iterating US shale producers’ stance of production increase. Brent-WTI spread remained wider around $6.78 level throughout the week, substantiating increase in US production along with intent of US producers to keep on exporting WTI to Asian locations. 3rd November 2017 EIA report of US crude export of 869,000 barrel a day, a reduced number from last week, however not a point of concern. EIA Weekly report reported a surprise build up of 2.2 million barrels with stock at 457.1 million barrels on 3rd November 2017, against a market expectation of 2.9 million barrels draw down. Brent prices closed on $63.52/BBL on Friday, while WTI closed at $56.55/BBL. CME WTI curve market closed on Friday at $56.90/BBL for December, $57.13/BBL for January and $57.29/BBL for February. Gasoline inventories at 209.5 million barrels reported on 3rd November 2017, recording 3.3 million barrels draw against a market expectation a 1.9 million draw down. 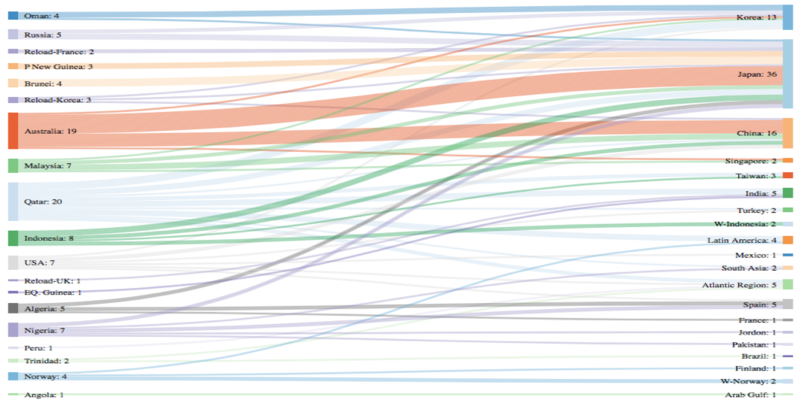 Baker Hughes rig count reported an increase by 9 in oilrigs, with total standing at 738. Overall crude market seems very volatile due to geo political situation in Middle East, as the fundamentals in term of supply are supporting a bearish run as oil rigs and production both increased in US and there is not as such any supply constraint elsewhere. 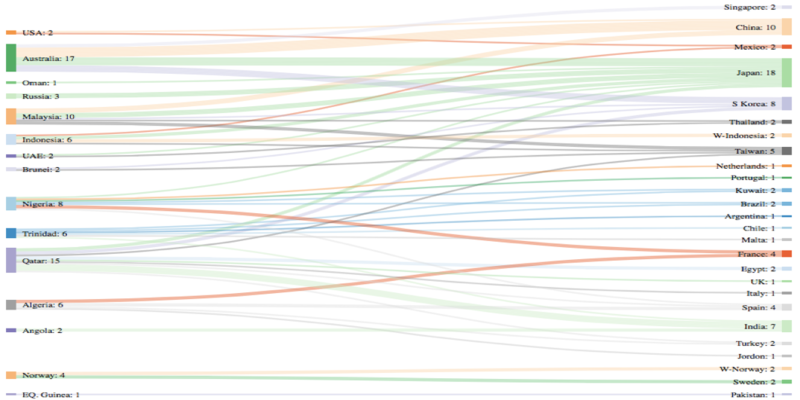 Baker Hughes reported no change in natural gas rigs and total number stands at 169. Working gas in storage was 3,790 BCF as of Friday, 3rd November 2017, an increase of 15 BCF from previous week, inline with market expectation of 14 BCF, almost end of injection season. This week from 2nd -8th November, Supply remained at 81.3 BCFD whereas demand remained at 79.4 BCFD, worthwhile increase is in industrial sector consumption, whereas supply remain same. Henry Hub prices had a bullish run through out the week on colder than normal weather outlook and Henry Hub closed at $3.21/MMBTU on Friday. CME Henry Hub future on Friday closed at $3.220/MMBTU for December, $3.310/MMBTU for January and $3.110/MMBTU for February, bullish run on winter demand. Dollar remained bearish majority of the week due to week consumer and jobless data along with US recent election results and delay in corporate tax, S. dollar index closed at 94.39 on Friday. Euro remained stable on primarily on weaker USD performance and closed at 1.16644. AUD/USD remained bearish on weaker China price and weaker wage growth rate outlook, closed at 0.76598 on Friday. Japanese Yen remained range bound and closed at 0.00881 (113.519 USD/JPY). The People’s Bank of China set the Yuan parity rate against the dollar at 6.6277. North West Europe: Winter started and cold weather next week. South West Europe: Winter in France and next week outlook is cold, Spain and Portugal in mild weather now. Latin America: Latin American countries, Brazil, Chile, Argentina and Colombia in hot weather and expected the same for next week. Middle East weather Hot to Mild with evening temperature eased a bit resulting in lower air-conditioning demand. South Asia: India and Pakistan mixed weather with air-conditioning demand in Southern part and heating requirement in Northern region. North East Asia: Korea and China in cold weather with same outlook for next week, whereas Taiwan and Japan in mild to cold weather. South East Asia: Still in hot weather and expected to remain same next week. North America: Mexico still hot, whereas US cold with same outlook for next week except Midwest. Keeping in view demand, bullish crude and coal price and cold weather outlook, North West European gas hub prices remained bullish through out the week. NBP UK Day Ahead price closed at 51.706 Pence/Thm ($6.82/MMBTU) on Friday, increased by 5.85% from last Friday. NBP UK front month jumped to 54.98 Pence/Thm ($7.25/MMBTU) on Friday, an increase of 7.83% from last week, adding to other parameters were a concern on long term nuclear power supply. TTF Spot price jumped by 6.92% and closed at €19.352/MWH ( the equivalent of $6.62/MMBTU), whereas TTF front month price maintained the same bullish run as spot and closed at €19.68/MWH ($6.73/MMBTU) on Friday. South West Europe prices remained bullish on weather along with nuclear reactors issues in France and lower Hydro based power generation in Spain, which as per information reduced by 21% in week 44. 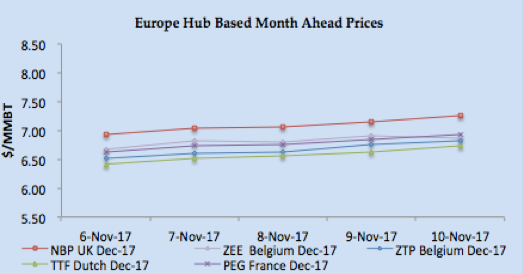 PEG Nord France Spot price closed at €19.514/MWH ($6.67/MMBTU) on Friday, whereas TRS France Spot jumped to €23.995/MWH ($8.20MMBTU), while Spain at €23.60/MWH ($8.07/MMBTU) on Friday. Front month prices in French market closed: PEG Nord at €20.24/MWH ($6.92/MMBTU) & TRS France at €24.00/MWH ($8.20/MMBTU) on Friday primarily low inventory and peak winter season. For Iberian Peninsula, forward price for November remained bullish and last transaction was done at €23.90/MWH ($8.16/MMBTU) on Thursday. Bullish fundamentals like winter season, supply concern from Australia, bullish coal & crude prices along with nuclear issues in France and UK plus lower hydroelectricity generation in Spain prevailing. 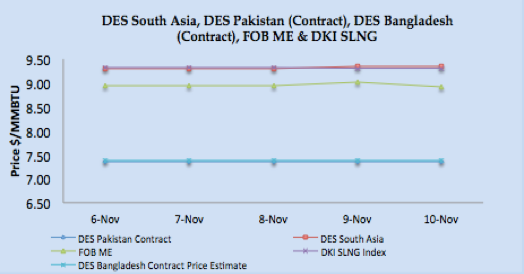 Lack of transaction on fixed price has kept the market in guessing mode, however, the direction has been set from Brent based January shipment for Pakistan and Egyptian market, which is coming around $9.65/MMBTU level for $60/BBL. Market hasn’t been able to react to Australia’s North West Shelf export facility shut down on Friday. Demand is heard in India, China and Turkey though buyers still cautious and watching the market. Russia Yamal LNG export facility is heard to be commissioning its first cargo in November, dates yet not very clear. Japan, Korea, Taiwan and India along with Pakistan still getting regular contractual volumes and based upon based upon 3-0-1, 14.5% Brent slope, the price is around $8.00/MMBTU. 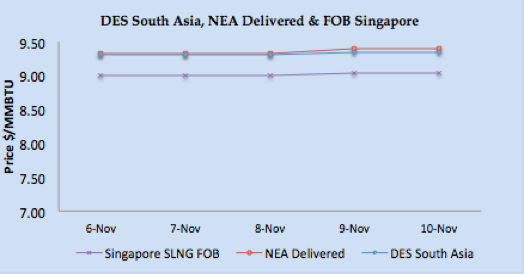 Asian price closures on Friday; SLNG NEA Delivered at $9.39/MMBTU and FOB Singapore at $9.039/MMBTU. Based upon FOB Singapore and Middle East, DES South Asia is calculated around $9.34/MMBTU level. DKI SLNG Index on Friday reported at $9.31/MMBTU. JKM Future curve market remained stable with front month at $9.13/MMBTU and $9.9.65/MMBTU & $9.55/MMBTU for January & February 2018 respectively, so basically focus now on January deals. 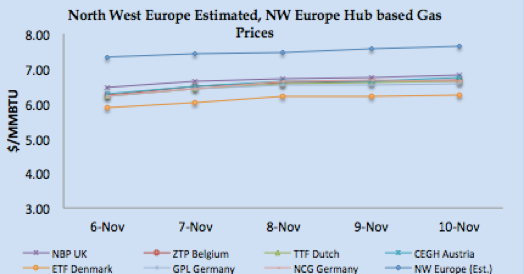 North West European LNG prices now bullish on its fundamentals though still taking direction from the Asian market. North West Europe prices are remained bullish and closed at around $7.65/MMBTU, 40 cents premium on NBP front month price. South West Europe LNG prices remained bullish on nuclear power generation issues, cold weather and lower hydroelectricity generation. 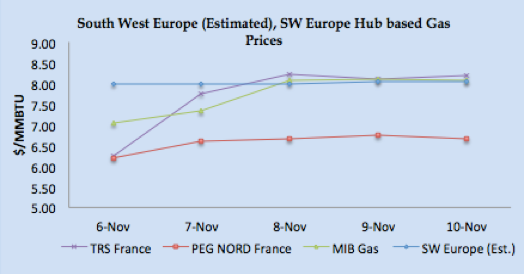 Based upon Iberian Peninsula gas hub price, PEG Nord and TRS along with Asian prices, South Western Europe prices are estimated in the range of $8.00/MMBTU. The arbitrage window still lucrative for reloads from European ports, $7.89/MMBTU FOB is the netback price for South West European ports. US Gulf Coast producer price on FOB basis for December delivery for Asian destination comes around $8.00/MMBTU level, for European destinations the netback comes around $7.10/MMBTU level. 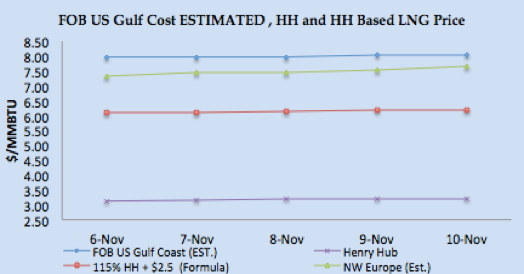 US Henry Hub based price is coming around $6.19/MMBTU for US based liquefaction companies, better netback for Asian and European destination. Pakistan is commissioning its second terminal on 28th December 2017, and with this terminal, Pakistan can import 10 MTPA of LNG. LNG prices this week remained stable however lack of transactions kept the market cautious. Focus is on January market and based upon crude oil bullish run along with winter, prices are expected to remain bullish; especially if China is back in the market then we expect a surge. Crude bullish run needs to be monitored, as supply/demand fundamentals are not suggesting a bullish behavior on crude. 104 vessels carrying 6.80 million tons (326.12 BCF) loaded from various supply centres, during the week 3rd -10th November 2017. 85 vessels carrying 5.14 million tons (246.66 BCF) discharged at various demand centres, during the week 3rd -10th November 2017. Six reloads from UK, France and Korea left for Japan, China and India. Disclaimer: This is a personal analysis based upon public information and should not be used for buying and selling of commodities. Source: SGX LNG Index Group, EIA, GIE and Reuters.